SIL Converters version 3.1 is intended to be installed using the Master setup program found here. SIL Encoding Converters 3.1 Setup—Conversion applications are installed and conversion Maps and Tables are copied to your hard drive. SIL Converters for Office 2003—Currently this installer only installs an additional operating system update needed to work with Office 2003 and 2007. 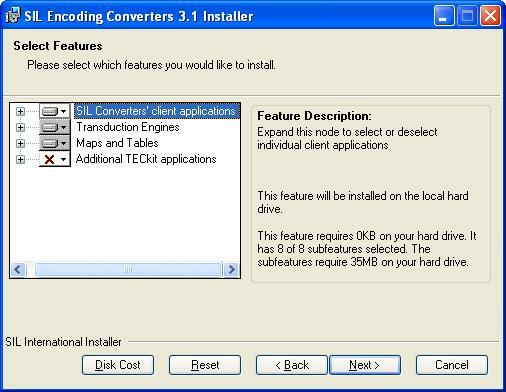 Converter Options Installer—A utility that allows you to activate the conversion Maps and Tables you want to use. If this is the first time you are running the installer, be sure to close all programs before starting the installation program, including the program that you are using to read this document. Several of the software prerequisite sub-installers will stop and tell you to shut down programs. Suggestion: If this is your first time installing SIL Converters, you may want to print out this document to guide you through the process. These installers may require that you answer some dialog box questions. Be sure to allow these updates and add-ons to be installed; they are necessary for SIL converters to run properly. Several of the software prerequisite programs may stop and tell you to shut down programs you were not even aware were running. Be sure you follow all instructions. If it seems the installer has stalled, it may be there is a dialog box waiting for you to respond. However, be patient. Some of these installers take several minutes to finish. This section is intended as a guide for initial setup. For detailed information on using the various SIL Converters programs, see the Help for SIL Converters documentation. You should probably choose all defaults, except if there is a Maps and Tables package that you might want to use. For example, many SIL entities have provided a custom Maps and Tables package for its members. You do not need to know exactly what you want to install the first time you run the Setup program. You can run the Master Setup program again to add or delete components. To use the suggested folder (recommended), click Next . For Advanced Users: As many of the components in the SIL Converters suite are shared utilities, the vast majority of the download will be installed in specific, fixed, shared locations. For example, most of the transduction engines are provided by DLL programs which must be in a folder that is in the Windows Path environment variable. For this reason, the TECkit, CC, ICU, Perl, and Python DLLs are put into the C:Program FilesCommon FilesSIL folder, which is also added to your system Path variable. However, the majority of the client applications, which otherwise don’t need to be in one of these shared locations (e.g. the Bulk SFM converter, the Clipboard EncConverter, etc), will be installed in the folder which you select from this dialog box. This screen allows you to select which conversion applications are installed and which conversion Maps and Tables are copied to your hard drive. Selected Map and Tables will need to be activated using the Converter Options Installer dialog latter in the installation process before they can be used in SILConverters' client applications. To install the most commonly used features and components, click Next . When you see the popup menu choose Will be installed on local drive. The SILConverters for Office application, which provides SILConverter support to the MS Office programs Excel, Publisher, and Access, will not install by default, nor even be visible in the feature tree if the Microsoft Programmable Interop Assemblies (PIAs) are not installed. 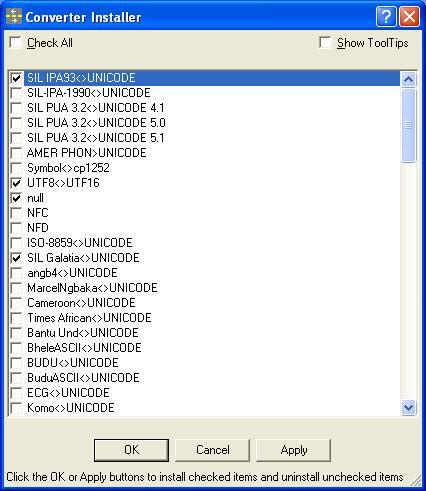 Search in the Help for SIL Converters document for the string “PIAs” for details on how to install these. When you have finished selecting any additional Map and Tables, click Next . When you see the SIL Encoding Converters 3.1 has been successfully installed message, click Finish to continue. 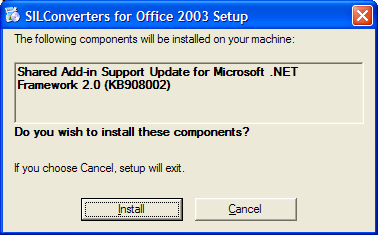 The SIL Converters for Office 2003 Setup currently only installs a critical operating system update. However, the update is needed by all users, whether or not you have Office 2003. This installer now checks to see if the update has already been installed and will not appear if it is. The Converter Options Installer allows you to add the converters you want to use to the system repository of your machine. This makes them available to all applications that support the Encoding Converters core. This selection menu is also permanently available from: Start / Programs / SIL Converters / Launch Converter Options Installer. All converters that were installed to your hard drive are listed. A dark check indicates converters that are selected to be activated. No check indicates converters that are not activated or are selected to be deactivated. Show Tool Tips: When this box is checked, hovering over the converter name will display information on the conversion. Select the converters you want activate. Most users will only use one or two conversions. Do not activate all the converters. Too many active converters will slow down your system considerably, particularly if you are using the Clipboard Encoding Converter application. Click OK or Apply to activate your selections. If you see this error message: begin > utf8 ?CC-F-Unrecognized keyword, it means that there is a version of the file cc32.dll somewhere in your Windows Path that is older than the one installed by SIL Converters into the C:Program FilesCommon FilesSIL folder. It is best if you delete any older copy of cc32.dll. The existing application which installed it will be able to use the newer version installed by SIL Converters because it is also on the Path. Delete or rename any versions of cc32.dll that may be in your C:WindowsSystem32 and C:LingLinkCellarSmv folders. Do a Search of your hard drive for cc32.dll and delete any versions older than 4/16/2002 (Version 8.1.6). Result: A Search Results window opens. In the All or part of file name: drop down box, type or paste: cc32.dll. In the Look in: drop down box, make sure Local Hard Drives appears. Click More advanced options and make sure Search system folders is checked. Result: The search should find cc32.dll in C:Program FilesCommon FilesSIL as well as in some other locations on your hard drive. Delete any versions of cc32.dll in folders other than C:Program FilesCommon FilesSIL. Warning: If the search finds versions of cc32.dll in .zip or other compressed file folders, you should not try to delete them. If you see an error while trying to use a TECkit map converter that says, "unexpected character: "?" at line 1", it means that there is an older version of the TECkit DLL files (i.e. TECkit_x86.dll and TECkit_Compiler_x86.dll) somewhere in your Windows Path that is older than the one installed by SIL Converters into the C:Program FilesCommon FilesSIL folder. It is best if you delete or rename these older versions of the DLL files. The existing application which installed them will be able to use the newer versions installed by SILConverters because they are also on the Path. See the Alternatives above for removing an obsolete CC32.DLL to find and remove any older versions of the TECkit DLLs not in the C:Program FilesCommon FilesSIL folder. If you want to use a Python script converter, you must also install a separately-available Python distribution of the same version number. SILConverters 3.1 supports encoding conversions using Python Version 2.5. This means you must have a Python Version 2.5.x. installed on your computer. It will not work with an earlier or later Python version (e.g. 2.4.2 or 2.6.1). As of this writing, Python Version 2.5.4.4 is available for download from http://www.activestate.com/activepython or from their previous version download area http://downloads.activestate.com/ActivePython/windows/2.5/ActivePython-2.5.4.4-win32-x86.msi. If you want to use a Perl expression converter, you must also install a separately-available Perl distribution with a matching version number. SILConverters 3.1 supports encoding conversions using Perl Version 5.10.1. It will not work with any other Perl version (e.g. 5.8.8 or even 5.10.0). As of this writing, ActiveState Perl Version 5.10.1.1006 is available for download from http://www.activestate.com/activeperl/. It is also possibly available from their previous versions download area http://downloads.activestate.com/ActivePerl/Windows/5.10/. If you are currently using the Perl add-in in SILConverters 3.0 (or FW 5.4.1), which is dependent on the Perl distribution v. 5.10.0, you will need to upgrade your Perl distribution to version 5.10.1 in order to continue using it in SILConverters 3.1 (or FW 6.0). If you want to run both version simultaneously (e.g. the Perl add-in from SEC 3.0 (old) together with the Perl add-in from FW 6.0 (new)), you can, but you still need both Perl distributions 5.10.0 and 5.10.1 installed in separate folders (e.g. C:Perl and C:Perl5.10.1). For the former version programs (i.e. SEC 3.0 and FW 5.4.1), you’d use the path to the Perl 5.10.0 distribution and for the newer version programs (i.e. SEC 3.1 and FW 6.0), you’d use the path to the Perl 5.10.1 distribution. In the process of installing this new version of SILConverters, if you uninstall an earlier version of SILConverters (e.g. 2.6.1), then it will likely disable the use of EncConverters in any of the earlier client applications (e.g. FieldWorks prior to v5.4, Speech Analyzer 3.0.1, and the Phonology Assistant 3.0). These programs which use the earlier version of the EncConverters core can be fixed by re-running their installation programs and doing an installation Repair. Old and new versions of the EncConverter core can be installed and work together normally. However, if you subsequently uninstall any of the programs that use the older version, it will incorrectly remove some core registry settings that the remaining program(s) depend on. As a result, the older client programs, such as Fieldworks (prior to v5.4) or Speech Analyzer/Phonology Assistant, will lose EncConverters functionality until the registry settings are restored. Typical error messages may state “Encoding Converter not found” or “Error initializing Document reader”. In addition to doing an installation Repair, the problem can be fixed by double-clicking on the RegisterSEC.bat file installed by some of those earlier client programs. You must execute the batch file while logged in to an administrative user account. On Vista, you can run it by right-clicking the batch file, then selecting ‘Run as Administrator’. RegisterSEC.bat can be found in the FieldWorks, Speech Analyzer, or Encoding Converters installation folder. For those that know how, you can also fix the problem by using regasm to register SilEncConverters22.dll in c:Program FilesCommon FilesSIL2.6.1.0 or 2.6.0.0 folder. Non-administrative Vista users may discover that some of their encoding converters, pictures, and media files are no longer available. This is due to Vista’s virtualization ‘feature’. For encoding converters, it is usually simplest to re-add the missing encoding converters. When a non-administrative Vista user creates a file under Program Files, instead of writing the files under Program Files, the files are created under c:UsersYourLoginNameAppDataLocalVirtualStoreProgram Files where YourLoginName is your Vista login name. If multiple users log on to a machine, there will be multiple, separate copies of these files. FieldWorks 4.9, Speech Analyzer 3.0.1, and SIL Encoding Converters 2.6.1 and later versions no longer write any files under Program Files, so this problem will be avoided. When upgrading from older versions of these programs, user files from Program Files are copied to the new location under c:ProgramDataSIL. However, the installers do not catch files from these virtual directories. If you are missing encoding converters after an upgrade, you can copy the contents from the MappingFiles and Repository folders from your VirtualStoreProgram FilesCommon FilesSIL to similar directories under c:ProgramDataSIL. SILConverters 3.1 may be installed on a Vista Standard User account as long as Administrator credentials are provided in the UAC dialog that will be displayed when you attempt to install. However, there is problem with one of the Microsoft OS update packages not installing properly on Vista Standard User accounts. So, if possible, it's best to try to install SILConverters while logged into an Administrative account. If this is not possible, then at least it is necessary that you manually install the lockbackRegKey.msi installer by double-clicking on it in a Windows Explorer window. If you want to install SILConverters 3.1 while logged into a Standard User account on Vista, then after installation (and before attempting to open any Office 2003 or 2007 documents), you should manually run the following program by double-clicking on it in Windows Explorer: C:Program FilesSILSILConvertersMS KB908002 FixKB908002lockbackRegKey.msi. If you don't do this, then each time you open a Word document, for example, it will attempt to re-launch the SILConverters installer.